For many runners, one of the most common challenges impeding their ability to train for a long race such as a 10k or especially a marathon, is simply finding the time to workout. Following are some tips that my clients use to make running and exercising a habit. If it’s hard to figure out when you could possibly schedule a workout, try tracking your time in a planner or use an app. If you are struggling to fit in a 30-45 minute workout, you may find that you spend that much time doing tasks that you could easily rearrange. This is appropriate for household chores like laundry, house cleaning, etc that you could do in the evening. When you find a good time to exercise, I suggest marking it on your calendar and keeping it like you would any other appointment. Alternatively, to stay consistent, use that time in your routine every day. Break up your runs. Sometimes you might only have 30 minutes in the morning and 30 minutes later in the afternoon/evening. 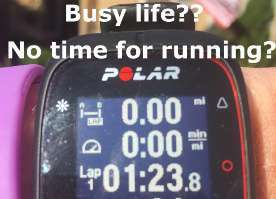 Trying running during both time frames to get in 6-8 miles. Find a training plan that’s appropriate for your physical abilities and follow it. Oftentimes, I find that the real reason people don’t seem to have time, is they don’t know what to do. Think of a personalized training plan as a blueprint for your success. Simply follow the workouts prescribed. Make running a priority. This means that you should plan when you run. Every Sunday, I look at my training plan and determine where/when I will get each workout completed. I plan around my workday, family activities and other commitments. Take full advantage of downtime. Unless you’re sick or injured, make sure that you get out for a run or get to the gym for some kind of workout. Even if you don’t have time to complete the run that’s on your training schedule, get something completed during downtime if it’s the only time you’ll have to exercise. Run in the morning. Make sure you get to bed early enough, so you can get up early and run. Completing your planned exercise prior to breakfast is one of the best ways to start your day. Train during lunch. This one’s for those that work out of an office or from home. I think it’s easier than identifying a separate workout time (like early in the morning or after work). This is a good strategy because you’re exercising during a time that’s likely least important to you. Don’t go to a restaurant for lunch, instead pack your lunch and eat it at your desk after your workout. Complete a 20 minute High Intensity Circuit Workout using Body Weight. This workout, detailed in ACSM’s Health & Fitness Journal, promotes strength development for all major muscle groups of the body. This sample workout, is a series of exercises that are performed in quick succession, with proper form and technique Exercises are performed for 30 seconds, with 10 seconds of transition time between each. 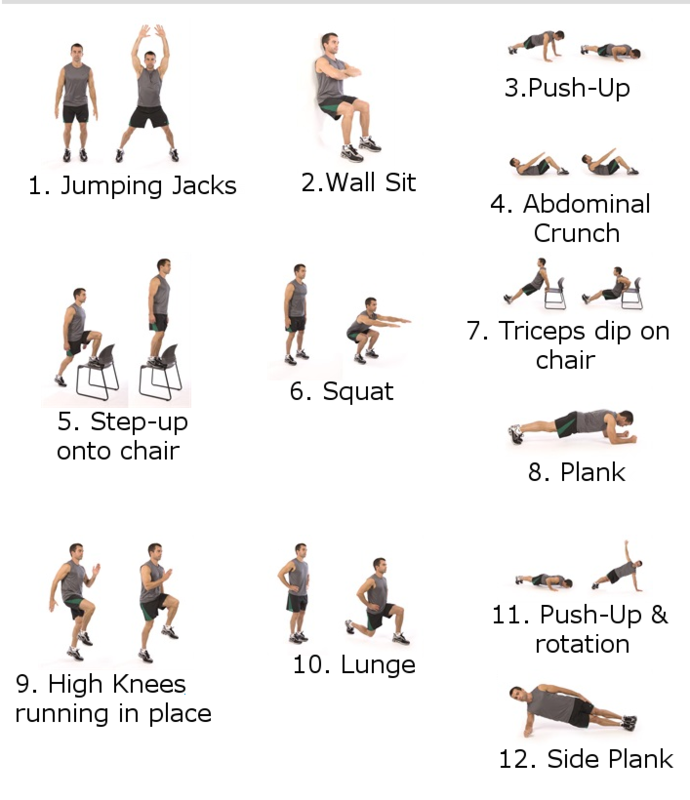 Total time for the entire circuit workout is approximately 7 minutes. 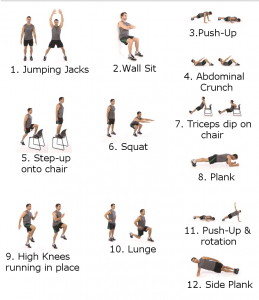 Repeat the circuit 3 times for a 20 minute workout. See the image below for details. Train alone if you need the time to clear your head. Keep your weekly training routine consistent regarding when you go. Run to/from work or to/from the bus stop. This works great if you have a place to shower/clean-up at work. Invest in a jogging stroller. 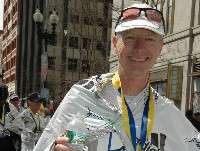 Most middle age runners don’t have kids, but as we approach our mid 50s and early 60s, grandkids come into the picture. If you’re helping to care for your grandkids, consider using a jogging stroller so you can complete your run while your grandkid gets some fresh air or a nap. Find a gym with childcare. Same as above. If your kids have graduated from child care, this may not be an issue. However, if you’re old enough to have grand kids, don’t let their presence keep you from working out or going for a run. Check them into the childcare for 60 minutes. Partner with another parent. For runners with younger kids, this is a great strategy. The concept is simple. You run while your friend watches both yours and her kids. Switch places and allow your friend to run while you care for the kids. When you make time for exercise, you’re likely to keep up with exercise that has value for you. Either the workout’s enjoyable or you benefit from the results you get out of it. When you find a workout has a place in your schedule and a reason to keep coming back, then you’ve created a habit.